As USD’s enrollment continues to grow and resident halls overflow, University Housing has had to get creative with room assignments. 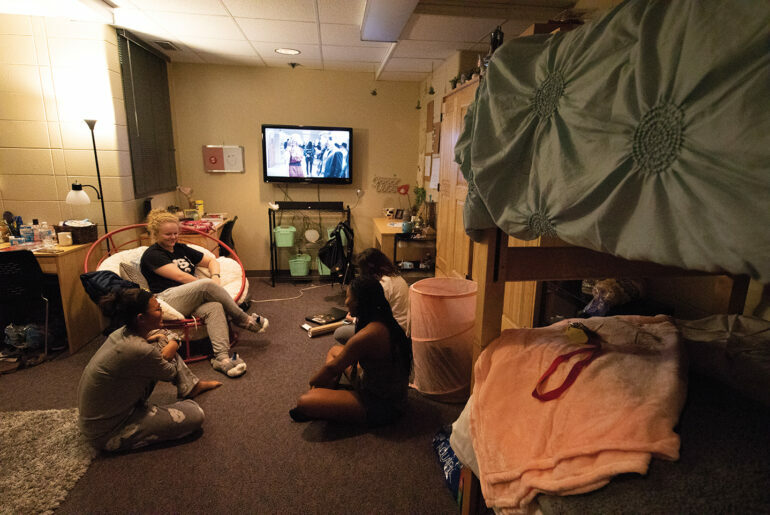 In order to accommodate the large freshman class, University Housing has had to make maximum use of the temporary spaces, which included transforming the floor lounges into four-person rooms and having the RA’s share their rooms with students. Ashley Hartnett, the director for University Housing, said close to 1,000 students are living in North Complex this year. She said this is more than usual. University President, Sheila Gestring, said the growth may be a result of new university initiatives. Kim Grieve, the vice president of student services and dean of students, said the living spaces are temporary, and as other students transfer or drop out, the students living in them will be moved to permanent spaces. Harnett said students placed in overflow housing filled out their housing applications later than others. Nybol Kur is one of four girls that are living in her temporary lounge room. Her roommates are Paige Schueller, Law Paw and Grace Kidd, all first-year students. Kur said she had already been accepted to live with another roommate, but she started to get nervous when her roommate was assigned a room and she wasn’t. In July, Kur received an email from University Housing informing her she would be placed in temporary housing. Two of her roommates said they had similar stories. Although they had previously selected and accepted roommates, these three girls were still chosen to live in the temporary spaces. Their original roommates are living in permanent traditional two-person rooms in North Complex. Kidd said she was not assigned to any other roommates. Kidd said they were not notified of their room assignments until July 12th. Before she was assigned her temporary space, Kur said she was unsure if she would have a place to live. Paw said she expressed her discontent with the housing department before move-in day. Kur said she also contacted the housing department with her complaints. “I would call them like every day, and say ‘what are you guys doing, like why aren’t you guys assigning me a room?’ I was really irritated by them, I felt like they weren’t organized,” she said. Schueller said they received a discounted rate on their housing because of the situation. “It’s not that big of a discount, it’s like a couple hundred dollars, it’s nothing crazy,” Schueller said. Kur said they do not know when they will be moved in their permanent housing. Kur also said the temporary situation has made it difficult to fully transition into dorm life. All four girls said they are nervous to be placed in their new permanent assignments. Schueller said she is nervous about getting a new roommate. Schueller also said she doesn’t feel University Housing would listen to their complaints about wanting to stay in their temporary room permanently. Hartnett said University Housing recognizes the difficulty these transitions will cause students. Grieve said she understands the stress these transitions can cause first-year students, but she is confident in the housing staff’s ability to address the problems. Despite their circumstances, their temporary lounge room has given the four roommates a chance to develop new friendships. Kur said that although none of her roommates knew each other before they were given their room assignment, she enjoys living in the space. “At first I was like no way… Now I’m okay with it because honestly I really like it, and I would like to stay in here,” she said. Schueller said the four roommates get along well and have fun living together. “It feels kind of like a giant sleepover. We’re all considerate of each other,” she said. Kur also said she enjoys the style of the room. Grieve said she is not worried about the quality of living in the temporary lounge space affecting retention. “The lounges are actually really, really nice, and students are always disappointed when they have to go into regular rooms,” Grieve said. Gestring said the university will begin to reevaluate its housing policies after they recognize a trend in increasing enrollment. Hartnett also said that conversations have begun on how housing can respond to a trend of increasing enrollment of students who wish to live on campus. Rachel Newville contributed to this story.